Many buyers don’t realize that a mortgage pre-approval doesn’t guarantee you’ll be approved for a Knoxville mortgage. In certain circumstances, things happen during the mortgage approval process that prevent a lender from approving your loan. While a vast majority of those reasons can be prevented by the buyer, since many buyer’s don’t realize this, they often make some common mistakes. 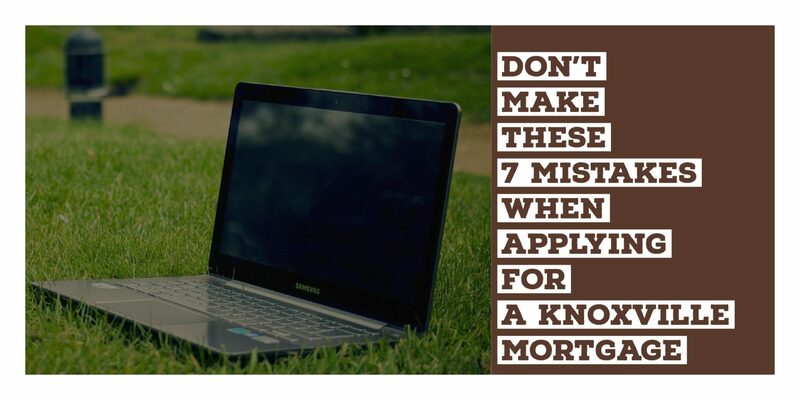 Here are 7 mistakes that home buyers make when applying for a Knoxville mortgage. Your mortgage pre-approval is based on your current employment status and income. If anything changes with this, it can delay or hurt your chance at loan approval. If for some reason your job changes during the mortgage approval process, be sure to inform your loan officer as soon as possible. Your employment status will be re-verified within a few days prior to closing, so don’t think you’re lender will miss this. While you’re in the process of applying for a loan to buy a West Knoxville home, do not apply for any additional lines of credit. That can be going out and buying a new car, furniture on a new line of credit, or applying for a new line of credit. Your credit will be monitored throughout the loan approval process and any changes to your credit could hurt your chance at loan approval. While you may be tempted to buy new items for your home, be sure to wait until after closing. Be sure to talk with your loan officer prior to making any large deposits into your bank without consulting your loan officer. Any large deposits over $500 may require further documentation, unless of course they are a paycheck. During the time you’re being approved for your loan, it can be important to not make any large purchases that could significantly alter your debt-to-income ratio. This could raise questions about your spending habits, as well as it could alter your credit score. Any little ding to your credit report could hurt your chances at loan approval if your credit score is borderline. When you apply for a loan, you’re required to share details about your income, credit history, and your financials. It can sometimes feel like a very personal invasion. Still, it is important that you’re completely upfront about all details when applying for a loan. During the process, any information your may have purposely omitted or left out could cause hiccups during the approval process. It’s best to be upfront and honest from the start, than to find out mid-way through the process that there is an issue. When you apply for a loan, you’ll be required to give banks statements on all of your accounts as far as two or three months back. During the process of applying for a loan, do not move large sums of money around or open and close accounts. This could make it more difficult to show the paper trail of where money is coming from. This might be the most obvious of them all, but you should most definitely pay your bills on time when applying for a mortgage. Any late of missed payments could ding your credit score, and you wouldn’t want that to hurt your or raise some questions while you’re in the process of buying a house. If you have questions about everything you can or cannot doing when applying for a loan, utilize your loan officer. They’re there to help you see the process through with you, and they’re there to help. It’s better to ask foolish question, than to have a deal fall apart over something that could have been prevented. Are you interested in buying a West Knoxville home for sale? If so, please do not hesitate to let us know. Rick can be contacted at 865-696-9002 or via email at Rick@KnoxvilleHomeTeam.Com. Kati can be contacted at 865-696-1888 or via email at Kati@KnoxvilleHomeTeam.Com. Also, be sure to check out our West Knoxville Home Search Page to see what homes are for sale in the area.